The confusing acceptance of American Express Cards in the UK. Shops that don’t accept American Express cards in the UK. Scotrail ticket machines at railway stations do not accept the card, but London Transport do - you can register your card as an Oyster card. Greggs do not accept American Express but Pret a Manger does. Paperchase does not accept American Express in store, but apparently does online. Lidl do not accept American Express but Aldi does. There is also a confusing difference between very small, medium and large retailers in their acceptance of the card. Any small retailer who uses a payment provider like izettle or Paypal can automatically accept American Express cards, usually at the same commission rates as for other cards. Apple Pay can also be used to pay via American Express, but Android Pay can’t, in the UK at least although it works in the US. Large retailers like Marks and Spencer and Boots want to accept as many payment methods as possible and they have a large volume of transactions which translates to lower commission rates. They also view the commission charges as part of doing business and will budget a percentage of their sales to cover this and cash handling costs. Online, most large retailers with bespoke ordering systems will have an American Express merchant account. Any online retailer that accepts Paypal can also take the card, which means that almost all of EBay is OK for American Express. Online retailers who don’t are usually those using payment processors like Worldpay who acquire merchant accounts for their customers, but do not automatically hande American Express. Where the problems arise in the high street is medium sized retailers with bank acquired merchant accounts. They have to apply for a seperate American Express merchant account. This is a straightforward process if they already have a Visa and Mastercard account, but even if they get one setting up their point of sale terminals can be too complicated. Not only does the merchant ID have to be set up on every terminal, but the contactless system is somewhat different. If their terminal is provided by their bank there may not be sufficient technical support to do this. Retailers who don’t accept American Express usually cite the higher commission fees as the reason. However, the differences are small and should really be covered by the cost of doing business. In the case of the payment providers like Paypal the commission rate for American Express is usually the same as for other cards anyway. One of the real reasons retailers don’t like American Express is the chargeback regime, which is much more in favour of the card holder than Visa or Mastercard. By not accepting all cards retailers put off higher net worth individuals who have a tendency to charge most things to their card. American Express also has a high percentage of the corporate card market which means that business people want to charge their business expenses to the card. We now have a strange situation where smaller retailers and larger retailers and almost every online retailer accept American Express, but a lot of medium sized retailers don’t. No chance of getting into debt as the account has to be paid in full each month. No real credit involved, which is why some religions don’t like credit cards. Very strong protection against fraud. Easier to get refunds or chargebacks on goods and services than with a credit or debit card. Good online system and mobile app for identifying spending by different card holders on the same account or separating out business expenses. Ability to register card as an Oyster card then print receipts later for business expenses. Good budgeting tools and mobile app spending alarms. If you want to apply for an American Express card click here. Some thoughts about the Calvine UFO incident. The "Calvine UFO Incident" is one of Scotland's most celebrated UFO cases and thought to be one of the best reports of anomalous aircraft sightings in the UK. The.... incident occurred at 9pm on 4 August 1990, at Calvine, a remote hamlet on the A9 near Pitlochry in Scotland. 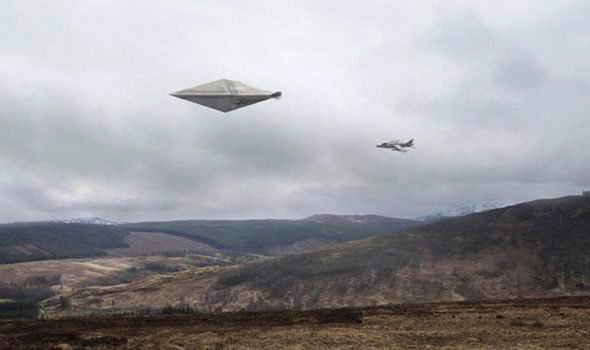 According to the scanty details released by the MoD, two men saw a large diamond-shaped UFO hovering for about ten minutes before it disappeared upwards at great speed. During the incident military aircraft were seen making a number of low-level passes. One of the men had a camera and obtained six colour photographs showing both the UFO and at least one of the jets. The negatives were sent to the RAF Pitreavie and the Scottish Daily Record who passed them to the MoD. In the event, it appears the Daily Record decided not to publish the story..... Nick Pope was the civilian opposite number of the DI55 desk officer during this period (1991-94) and he was the first to publish a brief account of the incident in his book Open Skies Closed Minds (1996). 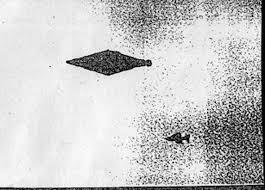 Pope described the photographs as “one of the most intriguing [UFO] cases in the MoD’s files”. He also describes how he kept an enlargement of one of the Calvine pictures on his office wall until it was taken down by his head of department. Nick Pope did a reconstruction of the image he had seen which you can find along with a short video here. I decided to apply my analytical skills to this case. For me this means looking at issues surrounding a story rather than the contents of the story itself. Doing this type of contextual analysis is something I learned at university (I studied Divinity) and it in the case of the Calvine UFO incident it highlights a number of issues with the story as it was originally presented. First of all I looked at the date of the incident: 4th August 1990. This was a Saturday, an ideal time for two men to be out walking in the hills, but it also a significant historical date because only two days earlier Iraq had invaded Kuwait in what would become the first Gulf war. The US had started sending naval forces to the region on Friday 3rd August, the day before this UFO was sighted. However, there is no independent evidence that the photo was taken on 4th August. The incident could have happened some time earlier and been misunderstood by the reporter. The claim is that the photograph was taken at 9pm. However, when I looked up the time of sunset, the sun actually set at 9:17pm that night in Perthshire. Would there have been sufficient light to take the photograph as it has been described? The photograph described by Nick Pope is not typical of something taken around sunset in Scotland. The reconstruction (below) looks more like a typical afternoon photograph. And another question: would two walkers have wanted to be up there knowing they had to come back down in the dark? I considered the possibility of a tourist getting caught out, but sunset in London that day was at 8:44pm so anyone from further south would have expected itt o get dark sooner. If the time is wrong this does not bring the photograph into question but it does bring the recording of the story, and the alleged date, into question. The MoD apparently identified the aircraft as a Harrier, but did not indicate where it had come from - information that was bound to be recorded somewhere. Given that the number of Harrier's in service was finite I decided to track down as many of them as I could. This turned out to be simpler than I thought because a lot of information relating to the first Gulf war is in the public domain in the UK and US. The Harrier was mainly sold to the UK, US and Canadian military. This ship was a helicopter carrier and was not Harrier capable until 2003. Most of their aircraft were onboard HMS Ark Royal which left Portsmouth on 3rd August to take part in an exercise called Operation TEAMWORK off the coast of Norway (see article here). Was in the process of converting from Harrier GR3 to GR7 with some crew undergoing training at Dunsfold and some in Arizona (see this article here). They were not deployed to the Gulf and were not in full operation readiness until February 1991 (see this article here). No evidence that any of their aircraft were in the UK at this time. This comes up in lists of Harrier deployments but the flight was actually disbanded in 1985. Aircraft of all types came back to the UK at that time for low flying training and this included in Scotland. There were also US operators of Harrier jets and at the time the US Air Force had bases and personnel in Scotland. They called the Harrier the AV-8B. The AV-8B saw extensive action in the Gulf War of 1990–91. Aircraft based on USS Nassau and Tarawa, and at on-shore bases, initially flew training and support sorties, as well as practicing with coalition forces. However on 4th August 1990 The USS Tarawa was in the western Pacific and then sailed to Iraq (source). The USS Nassau was in the Philippines on that date as part of 4th Marine Expeditionary Brigade and had gone there directly from the USA (source). In addition to this the US AV8-B and many of the Royal Navy's Sea Harriers had been fitted with extra fuel tanks that hung beneath the wings. These are not visible in the photocopied line drawing which edges the likelihood towards this being RAF aircraft rather than a Naval one. With new GR7 Harriers being delivered around this time it is possible that new aircraft were sent out on test from Dunsfold.If this happened it is far more likely they would have been tested over Salisbury Plain rather than flying all the way to Scotland, but this is just speculation. I think the two first questions that needs to be answered is "why a Harrier?" and "is the date correct?". There were no Harriers based in Scotland on 4th August 1990. However, this was only two days after Iraq had invaded Kuwait - which could explain why the Daily Record never published the story. Newspapers were full of the Kuwait invasion at that point. We know that 4 squadron, and other squadrons based in Germany, were sending pilots and aircraft to the UK for low flying exercises at this time. Mostly round Salisbury Plain, but it is entirely possible they had sent some pilots to Leuchars for a few days. Flying over the Scottish mountains at low altitude was considered much more realistic to combat situations and there were far fewer restrictions than there are today. Having accounted for most of the British Navy's Harriers and all of the US ones were on exercise and were then sent straight to Iraq. This leads to another question: "Who was the pilot of the Harrier?" Nobody has ever spoken out about this incident. Could it have been an experimental aircraft on test? This did not seem like a possibility because of the remote location until I checked out all the Scottish RAF bases of 1990. RAF Edzell, which was quite close to this location in flight terms, was home to the 17th Space Surveillance Squadron of the US Air Force which operated their Low-Altitude Space Surveillance System. It is thought that Edzell’s detection system was used for testing stealth features on aircraft as well as for detecting potential incoming missiles. However, this was out of action from June 1990 to 1993 (as far as I can find out). So nothing definitive, but it certainly can't be ruled out. 1. This is an unidentified man made aircraft, possibly secret. It might even be a smaller unmanned aircraft close to the camera. Nick Pope has been clear that he was told that it was neither Russian or American, but given the secrecy they may not have told him. In this scenario the presence of the Harrier is purely coincidental. Both might have flown through the same low flying area from different locations (Edzell and Leuchars). I would give this explanation a 50% probability. 2. Hoax. The photographer could have hoaxed the photograph. Nick Pope saw a copy of it and it seemed real to him. The MoD also analysed it and felt it was genuine. When the Daily Record did not run the story the photographer did not go elsewhere for publicity which is something a hoaxer would surely have done? I can't rule out a total hoax, but it does not seem very likely, maybe 35% probability. 3. Disinformation. I know, I know, I know. I am not a conspiracy nut, but during a war it might have been necessary to pass off some sightings as "little green men" rather than disclose their real purpose. The photographers have never come forward, but if it was government disinformation it would not have been referred for MoD investigation. I think this explanation is probably 25% probability. 4. A real anomalous aircraft or UFO. This is entirely possible and I would put it at 50% probability. I think this shows the value of this kind of contextual analysis in cases like this. It is possible to find out a lot about a historical mystery by looking at the historical and social context. I have not tried any of these, but this information does not seem to currently be on their web site so I am putting it here in case anybody is looking for it. It does not seem like their cornet and trumpet rims match up exactly.